Tell us about The Refectory Werribee Park? Located only 30 minutes from Melbourne, The Refectory is perfectly positioned within 10 acres of formal gardens surrounding the grand Werribee Mansion. The Refectory seats up to 180 guests and combines classic architectural features, luxury furnishings and high ceilings and offers a stunning setting for your wedding. Describe the stunning wedding and ceremony options. With the mansion as your backdrop, lakeside settings and landscaped gardens, The Refectory is the ideal venue for your garden ceremony. The formal gardens feature a parterre with expansive lawns and silky oaks offer a backdrop of soft foliage with views to the historic mansion tower – all conveniently located within walking distance to The Refectory. Bursaria can also host your ceremony and photography within the 19th century mansion, with exclusive use of the main hallway, grand staircase, salon and first floor landing for your post ceremony drinks. Tell us about the delicious food on offer? We’re an award-winning boutique catering company. Our style is fresh, seasonal and delicious. We love to work with all our couples to create the perfect menu and offer both grazing and plated menu experiences. Our events management team, chefs and wait staff all look forward to assisting you to create the perfect experience for you and your guests. We’re passionate about providing wholesome catering with a relaxed style – letting the food stand for itself as the hero of the dish. We love to encourage a feast to be enjoyed by all. Delivered with love and laughter. Is there a popular dining style you are seeing coming into the next wedding season? Our style is authentic and creative, taking guests on a food journey so that everyone can enjoy the celebrations in a relaxed environment. Our grazing menu served down the centre of the table is very popular and is accompanied with a variety of seasonal side dishes. The grazing menus are designed to be plentiful for guests and family to share and when everything comes together at the event – it’s a colourful affair. How do you match the delicious food with beverages? For a truly memorable event we offer a variety of beverages that are not readily available in major retail stores. We meet each season with our suppliers for a tasting session so that we can select the best wines to complement new dishes created by our chefs. We create the perfect menu for a lasting impression. 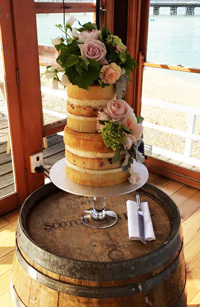 As well as weddings, what other celebrations do you cater for? We love celebrating all the big and little moments. From christenings to engagement parties, The Refectory’s stylish interior paired with a variety of menu options makes it perfect for a variety of special celebrations..
What do you love about being a part of a couple’s celebration? From the very first time a couple contacts us we welcome the opportunity to show you around The Refectory starting with your personalised tour. From there we take you on a journey, assisting you with your special day. On the day of your wedding when we see your guests enjoying themselves – eating, celebrating and dancing – it’s that moment when everything falls into place.